Inspired by salon glazing services the Alterna 3-minute shine boost is a weekly shine treatment that gives hair an instant blast of hi-def shine. 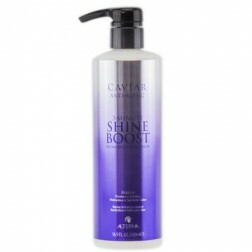 - salon-worthy shine without damage to the hair. 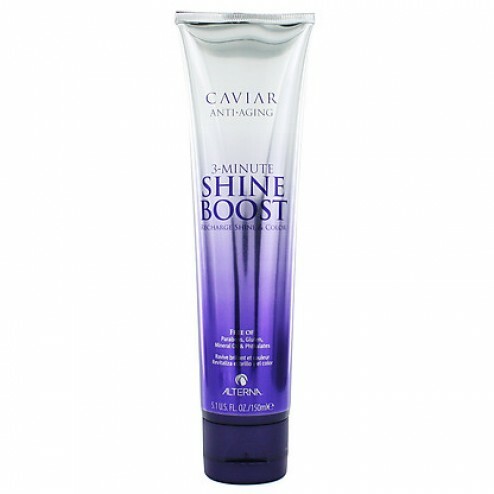 Ideal for hair that lacks vibrancy and shine. 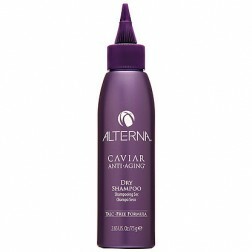 Perfect for natural or color treated hair. 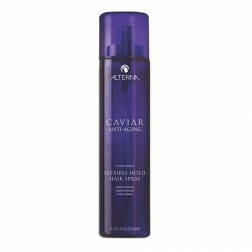 Caviar Extract - contains amino acids and Omega 3 fatty acids that help smooth the hair shaft and increase shine. Grapefruit Extract - powerful anti-oxidant that imparts vitality and shine while protecting hair from the harsh environment. Vitamin B5 - improves the condition of damaged hair by smoothing the surface with a protective layer of moisture that reflects light and makes strands appear shinier. Vitamin A & C - helps repair and resist damage caused by free radicals. Shampoo and condition hair squeeze out excess water. Apply product evenly from root to tip and leave on for 3-5 minutes. Rinse. For best results use 1-2 times per week. Salon Results In Just 3 Minutes! Water (Aqua), Dimethicone, Butylene Glycol, Amodimethicone, Oleth-10, Polyacrylamide, Ppg-3 Benzyl Ether Myristate, Isododecane, Isohexadecane, Caviar Extract, Hydrolyzed Soy Protein, Citrus Grandis (Grapefruit) Seed Extract, Panthenol, Wasabia Japonica (Wasabi) Leaf Extract, Glycerin, Polyquaternium-59, Polyquaternium-10, Superoxide Dismutase, Chamomilla Recutita (Matricaria) Flower Extract, Papain, Bromelain, Melanin, Pikea Robusta Extract, Glycine Max (Soybean) Symbiosome Extract, Foeniculum Vulgare (Fennel) Seed Extract, Daucus Carota Sativa (Carrot) Root Extract, Corn Oligosaccharides, Hydrolyzed Vegetable Protein PG-Propyl Silanetriol, PEG-40 Hydrogenated Castor Oil, Pantothenic Acid/ Yeast Polypeptide, Retinyl Palmitate, Ascorbic Acid Polypeptide, C13-14 Isoparaffin, Phenoxyethanol, Oleth-20, Cetrimonium Chloride, Laureth-7, Guar Hydroxypropyltrimonium Chloride, Caprylyl Glycol, Citric Acid, Ethylhexylglycerin, Hexylene Glycol, Disodium EDTA, Triethoxycaprylylsilane, Ethylhexyl Methoxycinnamate, Hydrolyzed Saccharomyces/Lactobacillus/Ubiquinone Ferment, PPG-26-Buteth-26, Niacinamide/Yeast Polypeptide, Hexapeptide-11, Adenosine Triphosphate, Apigenin, Oleanolic Acid, Biotinoyl Tripeptide-1, Saccharomyces/Copper Ferment, Saccharomyces/Zinc Ferment, Saccharomyces Lysate Ferment, Lactoferrin, Aminoacyl tRNA Synthetase, Phospholipids, Quaternium-15, Copper Oxidase, Acetyl Serine, Acetyl Methionine, Mica (Ci 77019), Titanium Dioxide (Ci 77891), Fragrance (Parfum). 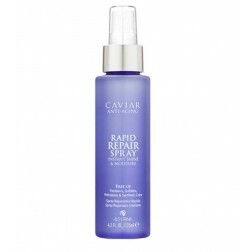 Alterna Caviar Rapid Repair Spray 4 Oz.